Before we look at the Beaufort Scale, we first need to understand the difference between mean wind speeds and gust speeds. Wind speeds are not constant – they are changing all the time. If you measured the wind speed at one second intervals, you would often get different measurements from second to second. Gust: a brief increase in the strength of the wind, often only lasting a few seconds. Lull: a brief decrease in the strength of the wind, also usually only lasting a few seconds. This plot shows the instantaneous wind speed measured at one minute intervals (blue line). It then shows the mean wind speed, which is given as the average of the wind speeds over the last ten minutes (red line). As you can see, the mean wind speed varies much less than the instantaneous wind speed. It gives an idea of what the wind speed is like if you take out all of the gusts and lulls, and is more representative of the wind speed over a longer time period. Note that the peak wind gust is almost 100 km/h, whereas the mean wind speed only gets up to around 80 km/h. The Beaufort Scale gives us a way of describing measured mean wind speeds (in numbers) with words. It was devised by Irishman Francis Beaufort in 1805, an officer in the British Royal Navy. He wanted to create a standard scale, which would allow naval officers to relate sea conditions to a mean wind speed when taking meteorological observations. If you would like to read about how the Beaufort Scale is used at sea, you can refer back to this great blog, Sea State and Swell. Since 1805, the Beaufort Scale has been adjusted to be used over land as well. The table below describes how the Beaufort Scale relates to the winds on land. Wind speeds are given in both km/h and also knots (a unit of measurement for wind speed, often used by mariners). Note that the Beaufort Scale uses mean wind speeds, rather than gust speeds. You can download a poster about the Beaufort Scale here, which also contains more information about hurricane force winds. 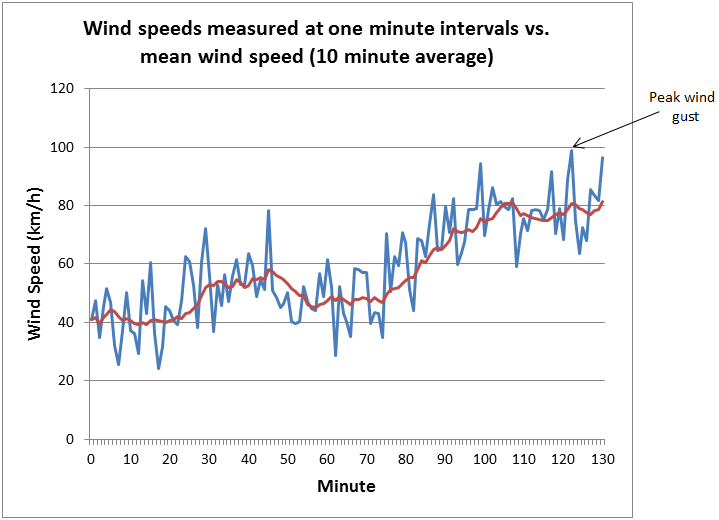 In the graphed example above, we noted that the mean wind speed reached about 80 km/h. According to the Beaufort Scale, the wind reached strong gale, even though it was gusting to higher speeds at times. MetService forecasters use some terms from the Beaufort Scale in our public forecasts. The terms we use include “light winds”, “gentle breezes”, “fresh”, “strong” and “gale”. When a wind direction is mentioned without a wind speed descriptor, we mean that the wind will be moderate. For example, the phrase ‘northerly wind’ would describe a wind blowing from the north, at a speed between 20 to 28 km/h. frequent gusts exceeding 110 km/h. Why are fast winds so damaging? where Ek gives the Kinetic Energy of a moving object (or wind), m represent mass and v represents velocity (or wind speed in our case). The kinetic energy of the wind can be thought of as a measure of how strong the wind will feel. Note the squared term in the equation; this means that if the wind speed doubles, the wind will actually feel four times as strong! This explains why winds can cause so much more damage once they get to gale force or stronger. New Zealand’s latitude within the “roaring forties” means that we can get some extremely strong winds. The Beaufort Scale gives us a consistent way of describing wind strengths in words, so that the public can quickly and easily interpret the wind strength when they hear the forecast. Because of this, the Beaufort Scale can come in very handy to both meteorologists and the public alike.